In honor of Latino Heritage Month (September 15- October 15), I’d like to highlight the latest poetry by two of my favorite poets, Latino or otherwise, Gary Soto and Pat Mora. Gary Soto’s new collection, Partly Cloudy; Poems of Love and Longing, looks at love in 100 poems, the first half from the girl’s point of view (“A Girl’s Tears, Her Songs), and the second half from the boy’s point of view (“A Boy’s Body, His Words”). Over the stove’s collar of blue flames. And placed them onto saltines. And you shrugged your shoulders. You nodded—god, you have shiny hair! Hands on my hips. Then I understood. While you sewed on my loose fourth button. Multi-tasking lover boy of mine? On your thigh, but how will I know? Of Kleenex to wipe away his river of tears. These are rumors, just rumors. The rumor of a butterfly. Soto, Gary. 2008. Partly Cloudy; Poems of Love and Longing. Boston: Houghton Mifflin Harcourt. More love poetry for young people is on its way in two collections by Betsy Franco and Pat Mora coming out later this year or early next year. I can’t wait! “Join hands!” is what we say. We plan a hoopla day. Kids are pictured in a variety of scenes, settings, and garb, suggesting multiple multicultural connections: Native dancing, flamenco, mariachis, etc. Join the Poetry Friday gathering at The Miss Rumphius Effect. Ahoy! Just in time for “International Talk Like a Pirate Day,” David L. Harrison has published a pirate poetry collection, appropriately titled Pirates (Wordsong/Boyds Mills Press, 2008), an over-sized book illustrated with vivid portrait-like paintings of a by-gone era by Dan Burr. However, Harrison’s book captures the more unsavory aspects of the pirate (lack of) character and acknowledges that pirates were/are first and foremost thieves. These poems do not glorify pirates as heroes, but rather capture the seedy, gritty life—and death—that was their lot. An introductory (and closing) note acknowledges the same and reminds us about the contemporary pirates that continue to prey upon ships today. Here’s a sample poem that reflects the rhythmic structure that Harrison so often incorporates in his poetry. I’m signing on a crew. You there! Can you tie a knot? I’d say you’ve snatched a purse or two. Ha! You’re rotten through and through! Phew! You stinking, drunken lout! You’d whack your uncle’s gizzard out! Harrison, David L. Pirates. Illustrated by Dan Burr. Honesdale, PA: Wordsong/Boyds Mills Press. This book is sure to be a hit—full of grim and gruesome details about ship’s rules, life at sea, grub, whippings, fighting, stealing, and getting marooned, captured, or hanged. Reader beware! Aaargh! Pair this with J. Patrick Lewis’s Blackbeard, the Pirate King (National Geographic, 2006). He focuses on the fascinating life of Edward Teach in poems, facts, and endnotes, accompanied by classic pirate illustrations by Pyle and Wyeth, and more. For more Poetry Friday fun, go to author amok. I recently decided to keep a book of poetry in my purse for those moments when you find yourself waiting with nothing to do. Since I’ve been trying to lighten the load in my bag (due to shoulder issues), I was pleased to find a tiny volume of a handful of Emily Dickinson’s poems (one of my favorite of the classic poets) at Half Price Books. It’s been fun to read and think through a poem here and there. Waiting with a poem is a pleasurable way to pass a few minutes—sort of a mental yoga—and I highly recommend it. And it’s been interesting to revisit some old favorites and even discover some Dickinson gems that I had missed along the way. For example, I had no idea that she had written about a storm—what some people claim might have been a hurricane. From Moore, Geoffrey. Ed. 1986. Great American Poets: Emily Dickinson. New York: Clarkson N. Potter Publishers, p. 54. We here in Texas are coping with the “emerald ghost” of Hurricane Ike this weekend, so this poem goes out to my friends and colleagues and all those in the Houston-Galveston area. Hang in there! I’m a big fan of Francisco X. Alarcón’s work—I love his succint language, in Spanish AND English, and the picture book format for his poetry that includes vivid and colorful mural-like illustrations. His latest is a wonderful addition, particularly for teachers and librarians who often feature ANIMAL poetry in their curricular units. His new book, Animal Poems of the Iguazú / Animalario del Iguazú published by Children’s Book Press, and illustrated by Maya Christina Gonzalez, is a bilingual poetry collection about the flora and fauna of the Iguazú rainforest and national park in South America. When he read from the collection at this summer’s ALSC Poetry Blast (held in June at the ALA convention) he said the poems were based on his travels to a rainforest in South America where he “interviewed” the animals. Most of the 25 poems are in the persona of the subject, “following the Amerindian tradition… the animals of the Iguazú speak for themselves,” including the toucan, parrot, hummingbird, swift, lizard, mosquito, giant ant, monkey, turtle, and the falls and jungle themselves. Here’s my favorite poem (in Spanish and English) that reflects the very heart of the collection and the rainforest itself. Alarcón, Francisco X. 2008. Animals Poems of the Iguazú / Animalario del Iguazú. San Francisco, CA: Children’s Book Press. Animal Poems is illustrated with mixed media art by Maya Christina Gonzalez, a 2008 Pura Belpré illustrator honor winner, in BOLD, vivid colors of thick deep green, turquoise and orange on thick pages of 100% recycled paper. It also includes a brief introduction and concluding information section. And for more information on Alarcón and his work, allow me to plug my book, Poetry People. For more Poetry Friday connections, go to Biblio File. Too, too many wonderful poetry books for young people go out of print (OP) in what seems like no time at all. It’s a shame. And it’s one of the reasons I keep this blog—to promote poetry books for kids so people will seek them out and keep them on the library and bookstore shelves. Well, here’s a new twist on solving this problem. 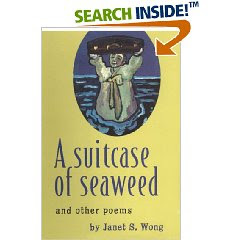 Poet and friend Janet Wong wrote me about something new she is trying. She’s making a print-on-demand (POD) version of A Suitcase of Seaweed (formerly OP) available again through BookSurge which prints books on demand and markets them through Amazon.com. So you can click on Amazon, search for A Suitcase of Seaweed and buy it there directly. (You might not even notice that BookSurge is listed as the publisher.) It will be printed and sent to you, all for $7.99 (plus postage). Cool, huh?! Janet writes, “I’m really excited about having this book available again. While the quality of this BookSurge edition isn’t as good as a regular trade paperback, it’s not bad…and I think it is better than some other POD versions that I’ve seen. The cost (to me) to produce a BookSurge edition could’ve been as low as $300 if I’d had print-ready digital files for the text and cover, but I didn’t have digital files, so it cost more to produce. I paid with a credit card, and will make my investment back after 200 copies are sold. I had a really great experience working with BookSurge, and I’m planning to bring Good Luck Gold and The Rainbow Hand back into print this way, too. *I think this is a really exciting possibility for school fundraising. The PTA could spend the $300-600 to produce a book, and if there is additional funding available, bring in a writer-in-residence and illustrator-in-residence to inspire the kids. Some of the kids could do art, while others would do writing, editorial, art direction, copyediting, marketing, and sales. The school could buy 500 copies at $3-5 wholesale to sell for $10. The marketing/sales kids could send out Amazon.com links to media. Wouldn't it be amazing if the media made a bestseller out of a book produced by a school? This is possible when the book is distributed online. And with a 35% royalty, wouldn't it be neat if a school earned thousands of dollars, to benefit itself or a charitable cause? Isn’t Janet amazing? What a thinker! What a poet! What a woman! And you can post your own reader review on Amazon, of course! This collection is one of my personal favorites (being of immigrant heritage myself) and I've cited individual poems from it several times, including "Poetry" (May 2, 2008), "Our Daily Bread" (Nov. 16, 2007), and "Face It" (Sept. 30, 2007). Plus, Janet created the art for the cover and the section divider pages. And Poetry Friday is hosted by the ever fabulous Elaine Magliaro at Wild Rose Reader. Although I’m not intending to get political here, I did want to post another poem for another historic moment, to be fair. When John McCain announced his vice presidential running mate, Alaska governor, Sarah Palin, I was pleased to see a woman on the ballot. Whatever your views, it is exciting to see this diversity in the candidates running for highest office. So, here’s a poem to mark that occasion, with a nod to her Alaskan "cowgirl" roots. Till it’s time to ride the school bus. Viorst, Judith. 1995. Sad Underwear and Other Complications. New York: Atheneum Books.